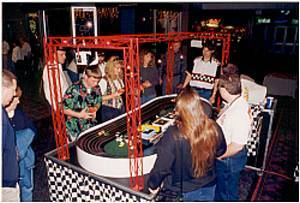 Portable slot car racing at it's best! 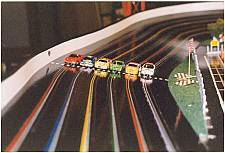 Up to six (6) participants can compete on this state of the art computerized racetrack. Great for corporate parties, trade shows, hospitality suites or just about anyplace where your race fans want to have fun. This professionally built H.O. scale track comes completely self contained. Pain-sakingly detailed look and feel to include miniature scale buildings, concessions, bleachers, signage, etc., We also provide professional supervised staff dressed in colorful pit crew uniforms. Complete play by play race commentary with realistic background noises.
? Computer aided race results tell who's the fastest and who the winners are in your group.
? A complete selection of racecars to choose from- NASCAR,Indy, Grand Prix and classic street machines.